The grooming staff at Pleasant Park Kennels and Grooming are fully trained in all breeds, with an impeccable eye for detail and a real desire to make your dog look his or her best. We offer several dog grooming service options at the kennel from just a nail trim to a full day at the spa. A full grooming treatment includes a nail trim, ear cleaning and plucking, bath, full blow dry and brush out, and trim to your request. 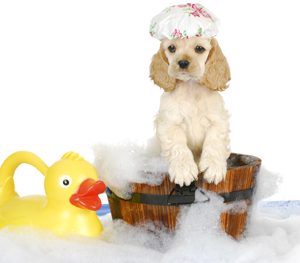 You may also book just a bath and brush for your pet to maintain their trim between grooms. Pleasant Park Kennels Dog Grooming Services in Windsor, Ontario are available by appointment only and can be booked as a separate visit, or at the end of a boarding stay. If you wish to book grooming while boarding, make sure you book ahead as dog grooming service spots tend to fill up fast. All grooming dogs must show proof of vaccinations prior to visiting the kennel. For a list of requirements please see Fees & Requirements. Please note that prices are estimates only, as the full price will depend on your request and the condition of your pet. The groomer will need to evaluate your dog in order to give a firm price. Dematting fees** (only where eligible, groomer must assess your pet): $20 per hour**Fees are in additional to regular grooming rate and only on eligible pets where matting is not severe. You may be required to have your dog dematted over multiple appointments. Your groomer will discuss options with you. 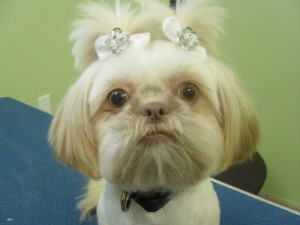 GROOMING PERKS PROGRAM – every 5th visit free for dogs groomed at least every 10 weeks. 10:00 a.m. to 1:00 p.m.
*May close at 4pm when there are no scheduled drop offs or pick-ups - please call during office hours. Come See Us at Woofa-Roo Fest 2016! © 2019 Pleasant Park Kennels | Windsor Ontario. Website designed and hosted by Mainstream Marketing.